Ayak Chichira, Ayuk Willku, Ginseng Andin, Ginseng Péruvien, Lepidium meyenii, Lepidium peruvianum, Maca Maca, Maca Péruvien, Maino, Maka, Peruvian Ginseng, Peruvian Maca. Find yourself depending on coffee for a boost in the morning? Why not try maca instead? 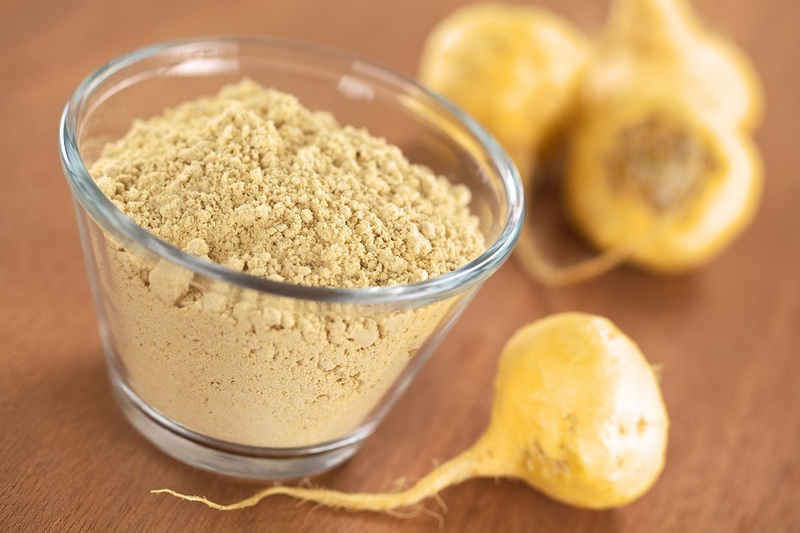 Maca is a root from Peru; it’s a tuber, like a potato, and offers an amazing energy boost for those with low energy. Maca however, unlike coffee, offers energy in a non-caffeinated way that supports the body. Maca has a light, nutty flavor and some easy, delicious ways to consume maca powder as a food are to: Stir a teaspoon of maca in a bowl of vegetable and lentil soup before serving; sea salt and maca root are a wonderful soup flavoring. Add a teaspoon to any herbal tea. Pour maca powder over organic, non-microwaved popcorn and flavor with coconut oil and sea salt. If you’re not watching your sugar intake, mix a bit of maca powder with enough grade B maple syrup or honey to produce a wet paste, and enjoy with a spoon. It’s a delicious dessert-like treat, and it’s great on bananas too. If you’re one who “needs” a sweet fix, this is delicious and healthy way to do it. It’s recommended to start with a 1/2 teaspoon a day, and work up to a teaspoon or two a day over the course of a few weeks. If you’re taking it daily, it’s best to take a day off each week. Maca is a food staple in Peru and there are no known effects of toxicity. However, occasionally some people experience adverse effects when they start taking maca, and these symptoms may actually be detoxification symptoms. This is because when a body more accustomed to consuming processed and cooked foods starts taking in such a nutritionally dense supplement, the body will absorb the superior nutrients it needs and “throw off” the old junk it doesn’t need for elimination. If this happens, you might feel badly but it generally lasts just a few days. You may also want to consider doing colon and liver cleansing before or while taking maca to quickly remove some of the waste your body is trying to eliminate. Doing so will help with many adverse symptoms.